shinfin™ leg fins strengthen your core muscles, stomach, buttocks & thighs. Great swim fitness fins for exercise programs, workouts, health plans to help lose weight, calories and fat. Want toned body & better fitness? + Lose fat, lose weight, burn calories. + Strengthen core muscles & stomach. + Stronger buttocks & thighs. + Better swim fitness & technique. + Same muscles as good swimming. + Better muscle exercise than flippers. + No calf muscle strain like flippers. + Relaxed, comfortable feet & ankles. + Easy wall push-off & flip-turns. + Lightweight & easy to pack in bag. + New exercise program workout. + Look after your fitness & health. 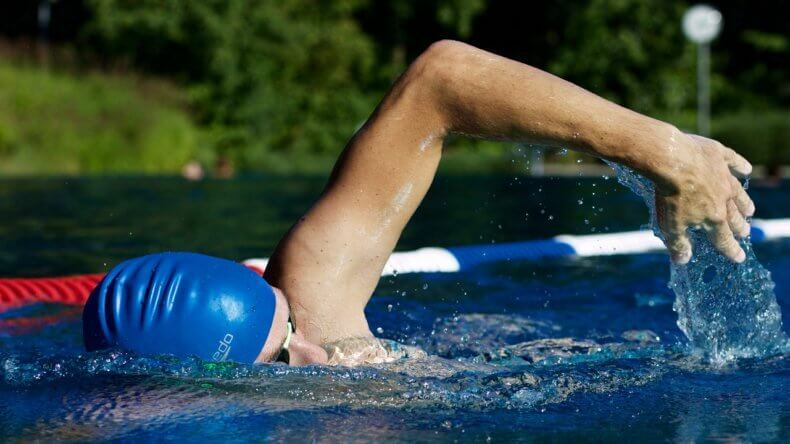 Fins for swim fitness – strengthen and improve! Your ideal swim fitness fins? Are you looking for swim fitness fins to improve your exercise program? Do you swim improve your health? Would you like to lose some weight and burn off calories and fat? Good swimming fitness fins should exercise the big muscles in your thighs, buttocks, stomach and torso. They should exercise these muscles in the same muscle sequence as swimming without fins. They should be comfortable and not strain your feet, ankles, Achilles tendons and calf muscles. Good swimming fitness fins should benefit cardiovascular fitness and help reduce unwanted fat. They should work for slower swimming exercises, through to faster swimming with a faster kick rate. Good swimming fitness fins should also help you swim with a smooth, efficient and streamlined technique so your natural swimming without fins becomes better too. The better your swimming technique, the more you will enjoy your swimming fitness programs. I have designed shinfin™ leg fins to offer all these benefits for swimming fitness, and more. They achieve this by connecting power directly to your legs, above your ankle joints. This transfers your swimming fitness workout to the big muscles in your thighs, buttocks, stomach and torso – the muscles you most want to exercise. In fact, these are the same muscles that good swimmers use for freestyle, backstroke and butterfly. They leave your feet and ankles comfortable and free to move naturally. Your feet, ankles, Achilles tendons and calf muscles are not strained like they are with foot flippers. So shinfin™ leg fins help you exercise the right muscles without hurting other parts of your body. At the same time, they guide you towards a natural streamlined stroke like good swimmers do. This is why these swim fitness fins are a true evolution for swimming fitness programs. The benefits of shinfin™ leg fins help swimming fitness for all levels of swimmer, adults and children. These benefits arise because I designed them to match natural streamlined kicking for freestyle, backstroke and fly. Since about 1990, I have developed over 50 prototypes. I have studied swimmers with leg fins, with foot flippers and without any fins, using underwater video equipment and biomechanical analysis. Testing has included beginner and intermediate swimmers through to elite swimmers at the Australian Institute of Sport and in the Australian Olympic Team. Testing has also included physically and intellectually disabled swimmers. I found that the same design biomechanics apply to all swimmers who wish to do a natural streamlined kick. This is why shinfin™ leg fins guide swimmers of all levels into a natural, streamlined kick with more benefits for swimming fitness. You feel how they help to keep your body horizontal for less drag. You feel how they guide you to kick from your hips, with only a little knee-bend. You feel the power coming from the big muscles in your upper legs, buttocks, stomach and torso. These are same muscles you should use for good “no-fins” swimming (without straining your feet, ankles and calf muscles like foot flippers). You also feel how they give the correct body balance to support your arm stroke. With shinfin™ leg fins, you know you are exercising the right muscles and strengthening a good natural kick – you can feel it. This is why they also improve your “no-fins” swimming fitness, technique (arms too) and speed. They are biomechanically advanced swim fitness fins, an evolution from all foot flippers for swimming fitness programs. Foot flippers cannot give the same swimming fitness benefits basically because they attach to your feet. Most good swimmers, coaches and swimming teachers know that foot flippers corrupt your kick. They stiffen and cramp your feet and ankles, and disrupt water flow. Foot flippers change your body position and your ankle, knee and hip movements, often to a “bicycle-kick” with knees bent too low. Foot flippers work more from your calf muscles and ankles – you can feel it. They don’t exercise your your upper legs, buttocks, stomach and torso like shinfin™ swim fins do . This is why foot flippers cannot give you the same swimming fitness benefits. For customer testimonials about people getting great benefits from these swim fitness fins, please see Swim Fitness Fins Reviews.